"The Paluxy River, also known as the Paluxy Creek, is a river in the U.S. state of Texas. . . . It is best known for numerous dinosaur footprints found in its bed near Glen Rose at the Dinosaur Valley State Park. 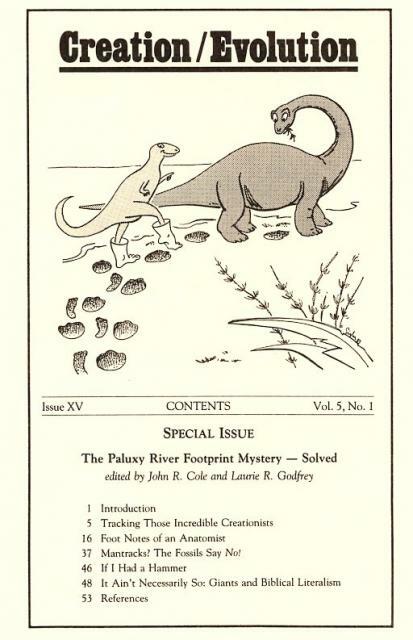 The Paluxy River became famous for controversy in the early 1930s when locals found dinosaur and supposed human footprints in the same rock layer in the Glen Rose Formation, which were widely publicized as evidence against the geological time scale and in favor of young-Earth creationism. However, these anachronistic "human" footprints have been determined to be mistaken interpretation or hoaxes."